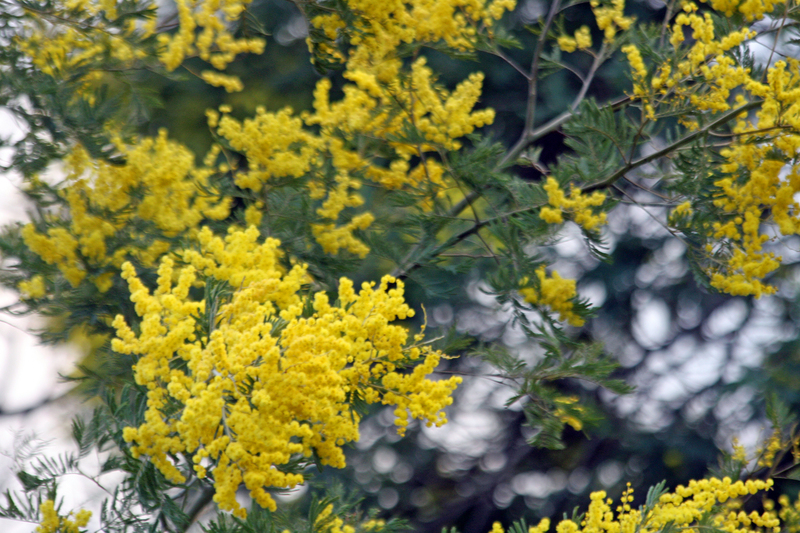 Every year from January to March the Mimosa trees flower and lighten up the area with golden pom pom blossoms. Winter makes a gracious exit and a new season begins: the Mimosa season. 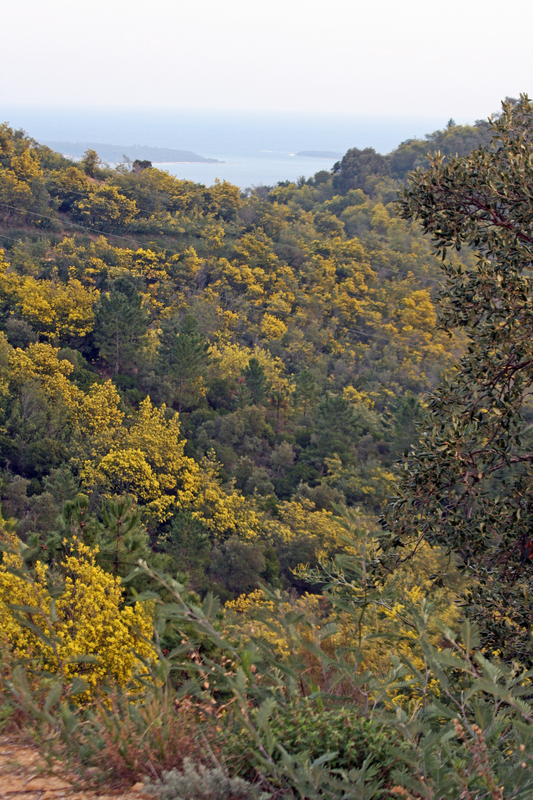 The arrival of Mimosa blossoms marks the beginning of a mild spell of weather to this region of the south of France. This time of year presents dream landscapes and ideal doggie walking conditions under bright blue skies. Mimosas are Acacia species that originally came from Australia. Imported to the French Riviera in the 18th century by the famous British explorer Captain James Cook, the sunny and mild climate encouraged the proliferation of this plant that took to the area so naturally. Today, there are more than 1,200 varieties of mimosas, 700 of which are from Australia. This little twig of sunshine took over the region. Perfumers were quick to appreciate the mimosa’s delicate fragrances and its abundance makes it a good selection for the development of perfumes. Many famous perfumes have mimosa in their formula. The perfume of winter sunshine. The hills of the Massif du Tanneron, the Estérel and the Maures Mountains begin to look like an array of golden mountains, as if an enormous glowing yellow coat were covering the largest mimosa forest in Europe. The famous 80-mile mimosa route runs from Bormes-les-Mimosas to Grasse (the world capital of perfume), crossing 8 famous stopover towns: Bormes-les-Mimosas, Le Rayol-Canadel, Ste Maxime, St Raphaël, Mandelieu la Napoule, Tanneron, Pégomas and Grasse. The French Riviera towns celebrate the yellow flowers: Mandelieu celebrates with floral floats that parade through the streets at its ‘Fête du Mimosa’ and Mimosa parades take place at the port of Mandelieu la Napoule. Last week we made our own Mimosa celebration hike amongst the Mimosa trees of the Grand Duc Forest where hikers and doggies can enjoy the forest air and beautiful views of the Gulf of La Napoule, Estérél mountains and the bay around Cannes. 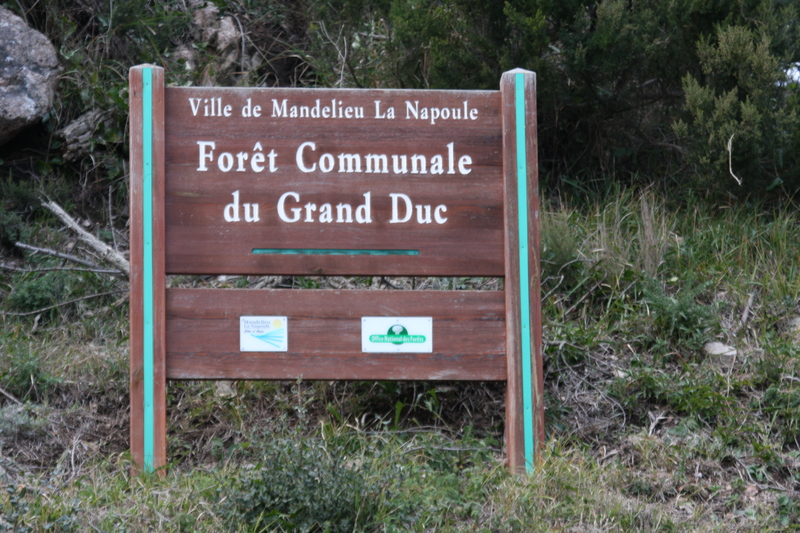 Click here to see a map to find the Grand Duc. 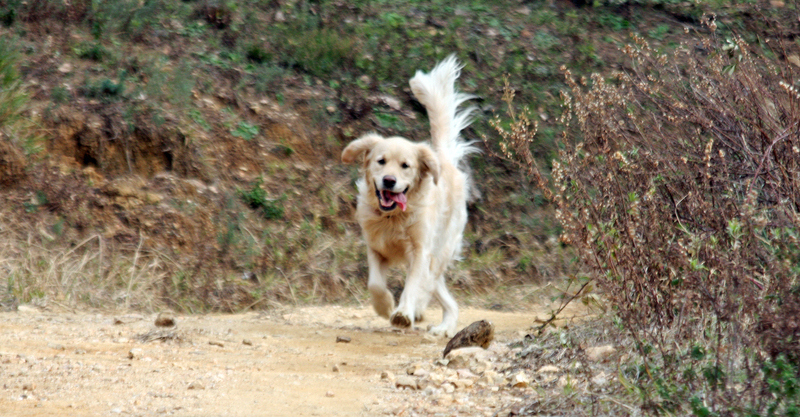 My friend Golden Retriever Toffee came along on the walk. 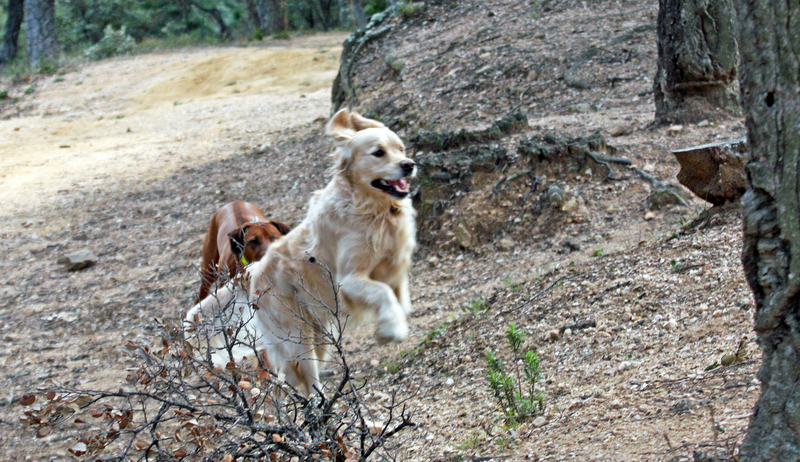 I don’t know if it was sniffing too much of the Mimosa perfumed air but he was certainly full of energy in this forest. 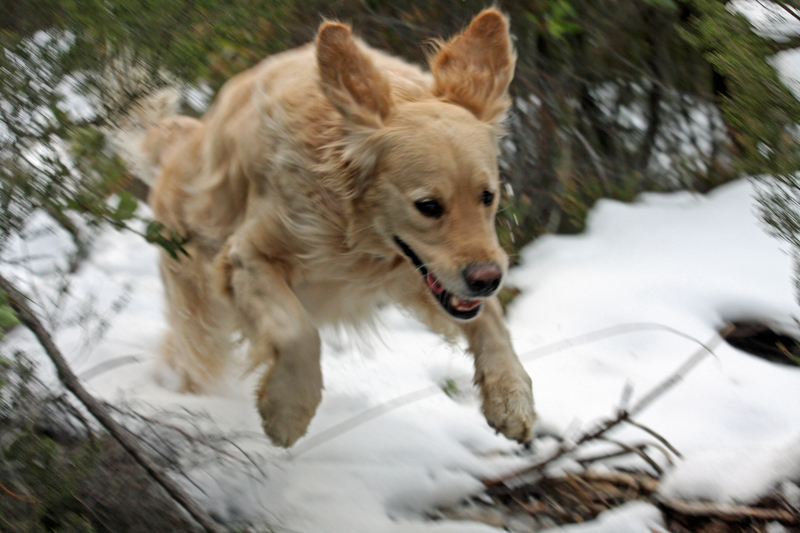 Toffee’s happy face and leaps of joy. 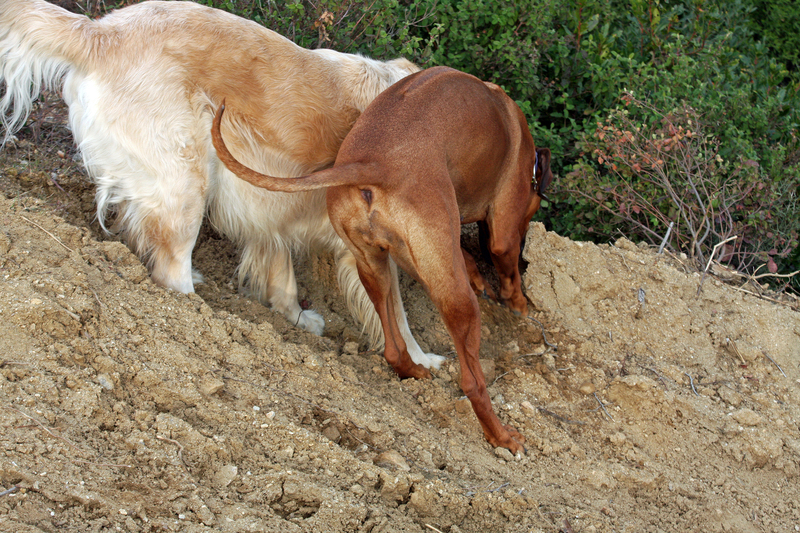 Super sniffing all around us. 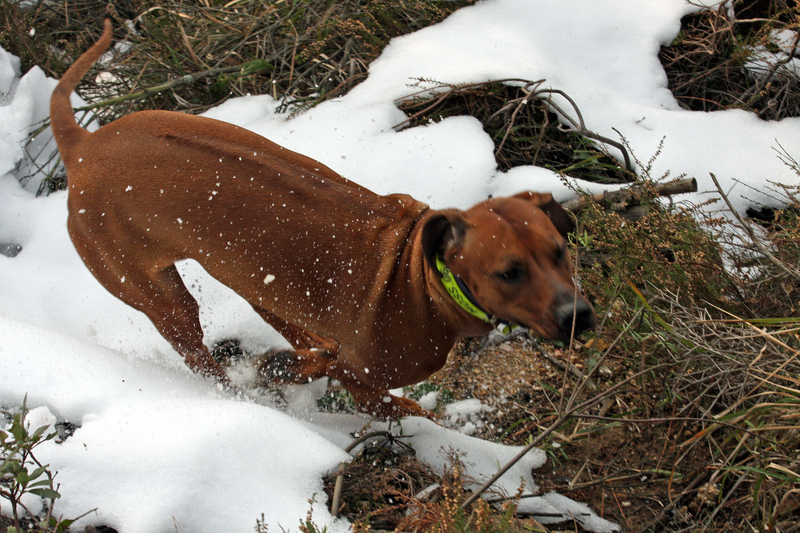 As we walked up higher into the forest, we saw patches of snow which was exciting since along the coast the presence of snow is very rare. The local French humans regard the sight of snow on the French Riviera as some ancient legend or myth. There was only a small patch of snow since we were not very high up, but it was enough for us to sniff, lick, crunch and jump on. Zola snow check for grip and turns. 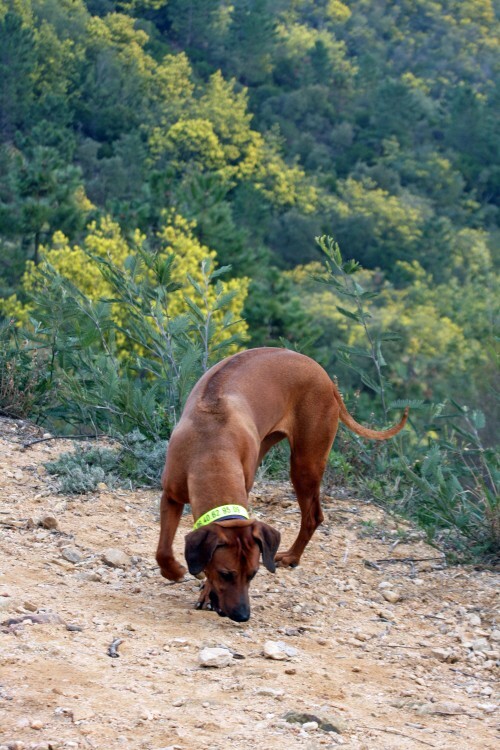 When we go into forests my human likes to put my bright yellow collar on so she can always see me as a flash of yellow through the trees if I go off for a little explore. 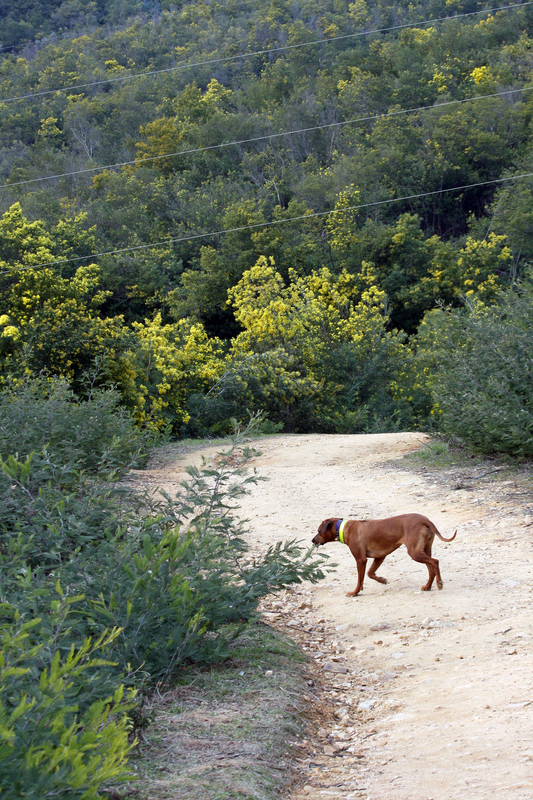 This yellow collar idea doesn’t work too well in a Mimosa forest! 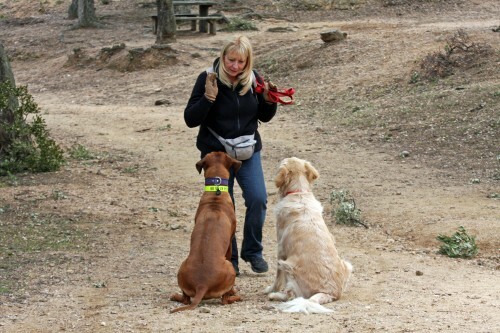 After enjoying the sights and smells of the Mimosa forest, what better way to end the walk than with some tasty treats from Toffee’s human. 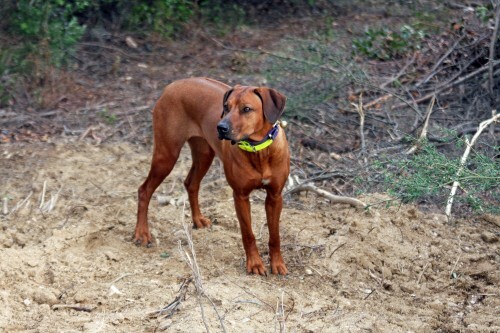 This entry was posted in Dog friends, Dog Fun, Dog Walks and tagged forest walk, Grand Duc forest, Mandelieu, Mimosa, walks in the south of france. Bookmark the permalink. What a beautiful walk. Also, you guys are lucky to be off leash. 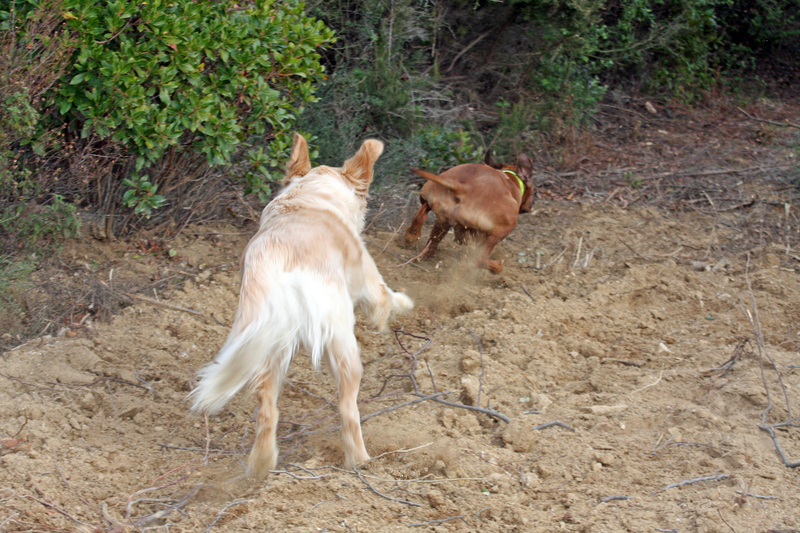 I hear some yammering sometimes about why I can’t be off leash but don’t really understand….blahblahblah. Mom and dad are thinking to bring us visiting a new place and maybe we could go where you and Toffee has been hiking happy!!! We’ll let you know if we come!!!!! So you can give us good suggestion about where go and what visit!!! You girls look fantastic and very very very beautiful!!! Wish were there with you!!! Have a great day!! Sweet golden hugs and licks!!! Is it me or that part of map around Grand Duc just looks like a dog’s head ? O_O The mimosas look great !